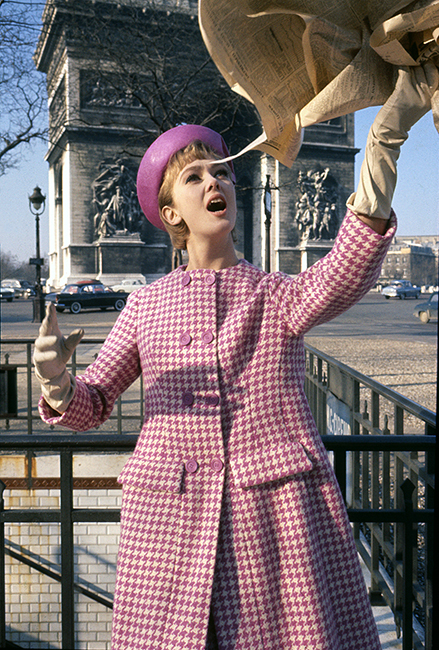 Duffy took this image in 1962 for an article in French Elle titled “Sweetheart Dresses (Robes À Toille Douce).” This session was shot in Paris at famous monuments with German model Ina Balke. In the background is the Arc de Triomphe, one of Paris’ most famous landmarks. Balke is photographed South-East of the monument between Avenue Marceau and Av. des Champs-Élysées. Duffy frequently used a newspaper as a prop which gave the images movement. When Glamour Magazine in New York saw this editorial spread they immediately hired Duffy. Quote ref: EL_0845_05 if you require press information regarding this image.